Someone’s trying to comment spam the hell out of me with “*@gmail.com” in their address field; I’ve keyword listed “gmail” into the moderation queue until it’s done. On the chance you have your “gmail” account listed in the e-mail field, you might want to swap it out for right now if you intend to comment (or just not put in your e-mail address; I mean, I don’t). I expect this is will stop after a day or so. If you do get bumped into the moderation queue, don’t be offended; I’ll liberate your comment when I can. To everyone who has to get into San Francisco today from the East Bay: You have my sympathies. Today is going to be a busy day: Got a flight, an interview in the afternoon and a reading tonight (Poisoned Pen Bookstore, Scottsdale, AZ, 7pm; I’ll be the fellow wearing the white carnation), so not a whole lot of time to play with all y’all. So lieu of actually being interesting, I thought I would post a single word, and then you can share your thoughts on that single word in the comment thread – and of course, talk amongst yourselves, and basically validate the theory I’ve been propogating that at this late date, the Whatever readers don’t actually need be to be around to amuse themselves. Share your thoughts, whatever they may be on the topic, and chat with each other. If this works, I’ll post another single word open thread tomorrow, too, and so on. Because I’m all about keeping you entertained, even when I’m hurtling over the planet in a metal tube, going from one place to the next. Have fun, and I’ll check in on you all later. To self-pimp just a little bit, today’s Book Tour Diary talks about the things I’ve learned about book touring after one week in. Check it out if you like; here’s a link to the whole collection of the Book Tour Diary entries if you need to catch up. Also, something I mentioned in the Google video but which I neglected to note here, which is that I’ve been told by Tor that Old Man’s War is getting a second printing in mass market paperback. When you add the number of that print run to all the previous runs of the book, it means that there are now over 100,000 copies of Old Man’s War in print. To which the only sane response is: Holy crap. If I haven’t told you people lately that I love you all, now is an excellent time for me to do so. Thanks, folks. I am appropriately agog and humbled. Here’s why: At this very moment I have three books with an Amazon ranking under (or over, I guess, depending on how you want to look at these things) the 1,000 mark, each in a different format: The Last Colony at #297 in hardcover, The Ghost Brigades at #258 in mass market paperback, and Old Man’s War at #908 in trade paperback. I’ll throw in the usual caveats about Amazon rankings being notoriously slippery, because they rank sales relative to other books on Amazon, not by hard sales numbers, and so on and so forth; still, that’s kind of neat. It’s nice to see the series, as a series, getting traction. 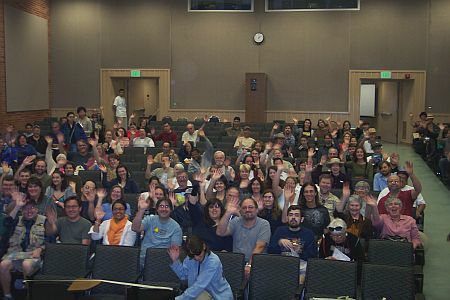 Here’s the crowd today at the LA Times Festival of Books panel on science fiction, waving hello to you. Well, part of it, at least; more came in later. The panel was excellent, but then, how could it not be, when there was Harry Turtledove, Kage Baker and Cory Doctorow on it? (Also, I was on it.) Then a signing, lunch with Cory (the ultimate pixel-stained lunch, clearly), another signing, a nice chat with some friends who were there at the book fair (including Whatever commenter Adam Rakunas, who delivered an In-N-Out T-shirt and a gift card, which a) made him my favorite person of the fair and b) will be converted to Double-Doubles very soon). Now I’m back and my plan is to sleep for 12 hours, or so. And then off to Arizona, where I will be at the Poisoned Pen bookstore in Scottsdale tomorrow at 7. All I have to say is: Yay! LA! This is my hometown (or at the very least my home major metropolitan area), and it’s always good to come back around, especially when my driving is largely confined to surface streets. I hope to be back soon. I love this place. Here you go. In it I talk about the online world, copyright, eBooks and regular books, and, of course, about that whole BaconCat incident. It’s about an hour long. You can tell I’m caffeinated. Also, here’s the YouTube page itself. Enjoy! What the hell is it with hotels and pillows these days? My hotel bed came with eight pillows on it, including one tubular thing that stretches across the whole bed, which means that it’s actually taller than I am. I mean, that’s just freakish. And then I have to throw the majority of them off the bed to sleep, so then it looks like my room was the scene of a kicky slumber party. Which, as a 37-year-old man, I’m not entirely sure I want. Somebody explain to me the pillow thing. I’m finding it more annoying the further along I get on my tour. Really, I want to know. Since you asked, I’ll tell you what was so cool about the Berkeley stop of the tour: It had the highest proportion of people who are actually my friends in it. 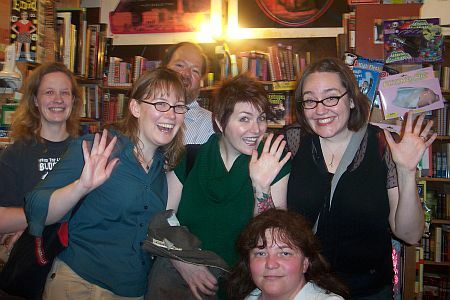 In the middle of this picture you see three examples: Susan, Jen and Mo, all of whom I have known for years and who I was thrilled to be able to see and spend a little time chatting with, because they are much, much more awesome than I (also in this picture: Whatever reader/commenter Madeleine F, SF Chron science fiction reviewer Mike Berry, and a lovely young lady whose name escapes me at the moment). It was also notable because Dark Carnival is without a doubt the most delightfully chaotic bookstore I’ve ever been to: between the screaming flying monkeys and the piles of books strewn about, it was what you’d expect a bookstore to be if you caught it mid-explosion, and I personally find that wildly appealing. I also went to Google, but I signed a non-disclosure going in, so I can’t tell you about all the cool things there, including the time machine (in beta). Whoops. Forget I said that. Suffice to say Google was as wildly Google-tastic as you’ve heard rumors about it being, and also a video of my talk there should be available on the Web sometime next week. I’ll let you know when it goes up, of course. Now I’m in LA, at a hotel that’s clearly too good for me; As I checked in Jim Lehrer was hanging around in the lobby with some pals, talking about, you know, important stuff. All I want to do is go to sleep. And that’s exactly what I’m going to do now. So, in fact, I have been largely avoiding the news — actually not so much avoiding news as it is not having a whole bunch of time to read it. What I’m trying to say is I have no clue what is going on out there in the rest of the universe. So: Anything you think I should know about? Yeah, I totally trust you not to lie to me. I noted earlier that I was looking forward to coming to Borderlands Books, and I’m happy to say I was not in the least disappointed; it was a great crowd, which included my sister and brother-in-law, as well as one of my best friends from high school (no pressure there), and of course Borderlands Books itself is just such a great store. And I met Ripley, the store’s famous hairless cat. Very cute, in a “I’ve been left in the tub for 10 hours and now I’m all wrinkly” sort of way. Many thanks to Alan and Jude and all the rest of the Borderlands staff for making me feel welcome and at home during my visit. I love this store, loads and loads. Today: I’m off to the Google mothership for a lunch event there, and then will slowly wind my way back up the peninsula, signing stock as I go, to end up at Dark Carnival in Berkeley at 5:30. I’ll be signing there, and then I’m off to the airport to land in Los Angeles, where tomorrow — gasp! — I have a day off, which I will spend sleeping and hopefully seeing friends. Sunday I have my LA Times Festival of Books appearance, with Cory Doctorow, Kage Baker and Harry Turtledove. That’s pretty good company. I deem this book essential not just because every other star in the science fiction universe says it’s great (it is), but rather because I think essential is a good description of the reason Scalzi is so much fun to read. His prose it and his story are stripped clean, smoothed down to the essentials. He packs more action into a 300 something page novel than some writers manage to get in a 3,000 page trilogy. Everything is crystal clear. The universe may be complicated and the aliens jockeying for the limited resources in that universe may be complicated, heck, even the politics of the human race are complicated, but in Scalzi’s precise vision, all you get are the essentials you need as a reader to plug yourself into the story and set yourself loose at light speed. Scalzi is an essential writer to read because he offers readers only the essentials they need to get out there in his universe and have one hell of a good time. Well, shucks. I do try. Coincidentally, or perhaps not, I had an interview with Rick Kleffel (who writes at The Agony Column) today, over at KQED, and what I’m really proud of was that I think it’s the first interview I’ve done where I may not have muttered a single “uuuuuuuh.” We’ll have to wait until it’s released, of course, to see if I’m correct. 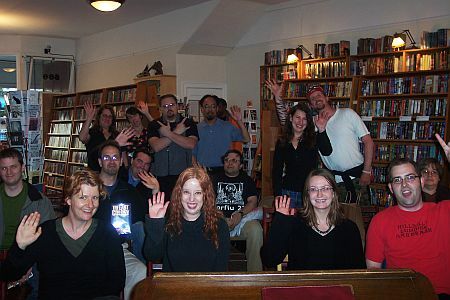 I have to tell you, the Half Moon Bay appearance was something of a question mark for me; I didn’t know much about Bay Books, and I didn’t know if I knew anyone in that area. 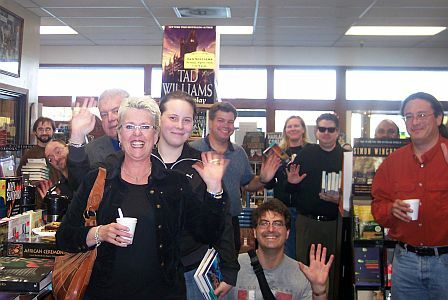 But you know what, The staff Bay Books did an awesome job of promoting the event, because the store was packed with folks (including my pal Michael Rawdon, there in the center of the picture, who with his friend Andrew trekked down for the event). I had a great time chatting with everyone, and when it was all done, they sent me off with a box full of cookies. You can’t beat that. So now that’s two really excellent appearances. I like this tour. Gotta get ready for a radio interview. Later. It’s just that Duane Wilkins of the University Bookstore is so damn tall. I wanted to make sure I gave a shoutout to Duane and all the folks at University Bookstore for such a great event. If you’re an author, I can’t imagine a better place to come ’round for a visit. Incidentally, I do have pictures, which I plan to get up. It’s just that my Flickr uploader is being hellishly balky. I’ll let you know when I manage to get them up. 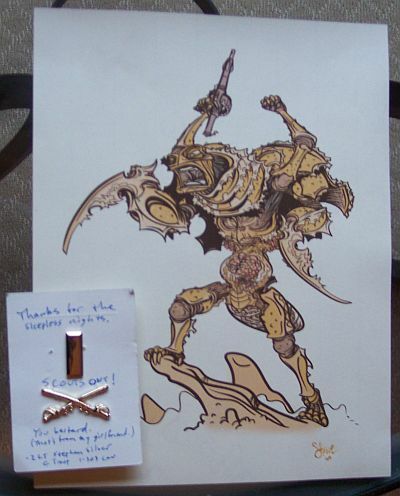 Seriously, people, how cool is this stuff: First, artist James Stowe’s interpretation of the Consu from the Old Man’s War series. The Consu, you may recall, are the mysterious hyper-advanced race of aliens who may or may not be messing with everyone’s heads in that creepy alien way of theirs. Stowe’s interpretation of what the Consu are was not what mine was; his is a lot cooler. Here’s a closer and cleaner look at this particular artwork, over at James Stowe’s site. Second, I was surprised and honored when 2nd Lt. Stephen Silver presented me with insignia by way of thanking me for the good reads. I’m always very happy when someone in our armed forces tells me I’ve managed to get it right in my books, and I think this is another positive affirmation. As I said, very honored. Thanks to both of them for the gifts. They were highlights of an already supercool Seattle experience. In other news, I’m in San Francisco at the moment — flight delays kept me from getting in at my appointed time, but that’s not entirely surprising — and I’ve got a couple of hours before I head down to my Half Moon Bay reading. I’m spending it typing (hello!) and jamming sugar and protein down my throat so my brain doesn’t turn into pudding before my reading. This is the exciting touring life. 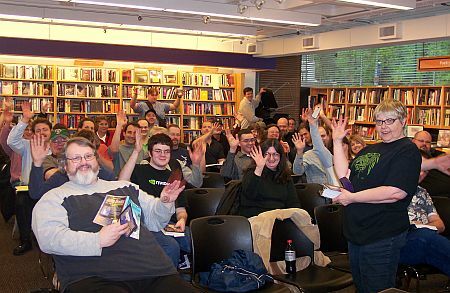 Here’s the crowd for the first night of the tour, at the University Book Store in Seattle. They were full of awesome. And, as a bonus, I think the reading and the signing went really well. It got the tour off on a good foot, to which I can only say: Thank you, Seattle. Everyone else is going to have to work to be as full of awesome as you. Would post more, but am about to slip into a coma, and have a morning flight. Sleep now, posting tomorrow. Here’s an interesting question for all y’all; As you know, my day over the next three weeks will be filled with traveling, sitting in hotel rooms, going to tour events and (hopefully) seeing friends and depressurizing. I’ve been so busy doing each of these today, for example, that I actually haven’t the slightest idea of what’s happened in the world today, which makes me suspect that if I really wanted to, I could go until May 10 without reading any real sort of outside news at all; in effect, being a media bubble boy, oblivious to the world outside my own little book tour. My question to you: Should I do this? 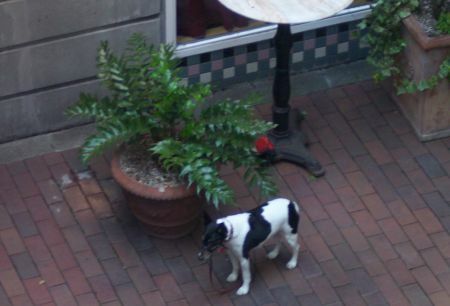 And to celebrate, here’s a picture of the muzzled dog that I can see from the window of my hotel room. Poor doggie. Although, who knows maybe it is a biter. Off to dinner with friends. See you all tomorrow. Waiting for my plane. And it’s on time, so far. Being at the airport means I have officially started my tour. Very exciting. Will be in Seattle in, oh, eight hours or so. I’ll check in then. 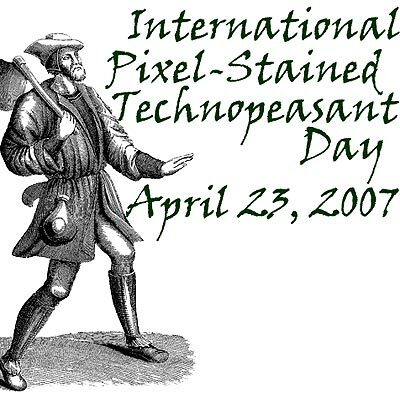 Happy International Pixel-Stained Technopeasant Day! This is the day when all of us Webscabs celebrate our undermining of the dominant paradigm by giving away free reading to the lot of you. Because it just feels good. Tingly, kind of. Like a nine-volt to the upper lip. And what am I giving away today? How about the first half of a young adult novel I wrote ten years ago, called The Durant Chronicles: Crisis at Tlada? It’s filled with excitement, adventure, interstellar political intrigue, and, of course, alien fruits the size of your head. Now, you may ask, why give away only the first half, and not the second half? Because I never wrote the second half, that’s why. No, I don’t remember why; I actually like this story, so I didn’t stop writing it because I was bored. Maybe I’ll get around to it again if sufficiently motivated, and that’s a big hint to you YA editors out there. In the meantime, however, I think the rest of you might enjoy what’s here. Here’s the link. It’ll take you to an .rtf file, which should be readable on just about anything electronic that reads text. Feel free to reformat it to your tastes. Also feel free to share (non-commercially) with family and friends, although I would appreciate if you write about it that you link back to this entry rather than host it on your personal site (that way I know how many people downloaded it). This novel fragment is yours free to read; you don’t need to pay me a damn thing for it. However, if you find yourself enjoying it so much that you feel the need to show your appreciation in the form of cash, allow me to suggest that rather than sending the cash to me, you instead send it to Reading is Fundamental, which is an organization that supports literacy in children and adults, and that’s something I can really get behind. Indeed, I would ask all participants in International Pixel-Stained Technopeasant Day to list a charity and ask their readers to support it, in lieu of paying for all the delicious free reading they’re getting today. But wait, there’s even more technopeasant goodness! As it happens, yesterday at Penguicon, the utterly fabulous science fiction/open source computing convention, I was on a panel with Charles Stross and Tobias Buckell about using free electronic works as a way to market one’s self. The recording of that discussion is up now on the Time Traveler blog for your enjoyment, and yes, we talk about International Pixel-Stained Technopeasant Day. Because how could we not. 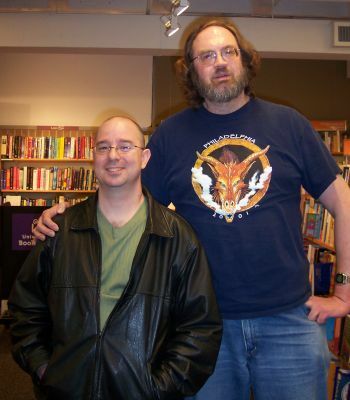 And speaking of Charlie Stross, he’s got something up today, too — go here to find out what it is. I assure you, it’s even cooler than what I’m giving away. Update, 5:39am: Jo Walton, who founded the day, lists more participants here. Update, 6:40am: The IPSTP LiveJournal community also has a nice listing of free reads. And of course I’ll remind all and sundry that I have a standing entry of all the other creative stuff I’ve given away over the years.